Reader Allissa Smith was particularly interested in The Legal Genealogist‘s webinar earlier this week on criminal court records because of one ancestor: her second great grandfather Francis C. “Frank” Rorabaugh was the sheriff of Prince William County, Virginia, from 1904-1911. But outside of some newspaper articles talking about finding a suspect, she hadn’t been able to find out much about him. Allissa, you’re in luck. 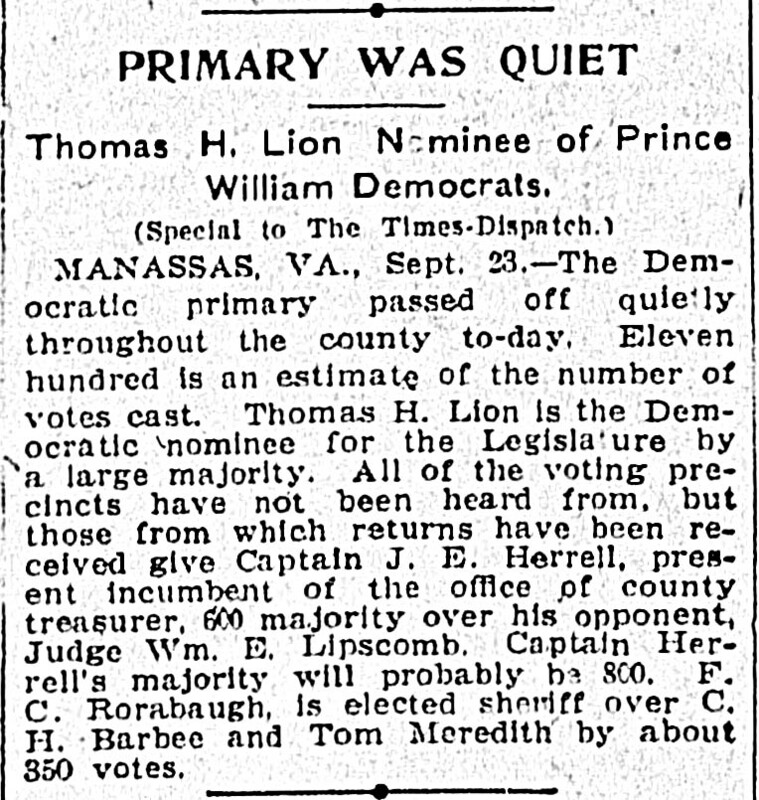 Because there’s simply a wealth of information available on sheriffs in Virginia generally, and on your second great grandfather in particular. You’ve got a road trip in your future to Virginia, of course, but oh… what you’re likely to find when you get there! So you’re lucky to begin with that there’s so much information available about Virginia Sheriffs. But you’re also very lucky because he was a Prince William County, Virginia, sheriff, and Prince William County, Virginia, has RELIC. That’s the Ruth E. Lloyd Information Center (RELIC), a special collection devoted to genealogy and local history with a focus on Virginia and Prince William County, that’s located at Bull Run Regional Library in Manassas. And RELIC is simply one of the best local collections you’ll ever have the pleasure to find. Not only does it have a periodical called the Prince William Reliquary, that’s written about Prince William County Sheriffs including Frank Rorabaugh in a two-part series — Prince William County Sheriffs 1731 – 1904 and Prince William County Sheriffs 1904 – 2004 — but it has collections of the local newspapers of the time and, perhaps best of all, its index of its Photographic Archive of Prince William County says it holds a photograph of Frank Rorabaugh. See what I mean about a road trip? 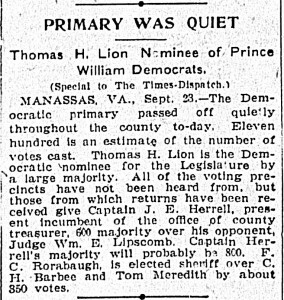 And you’ll need to head to Prince William County anyway, since few of the 20th century Prince William records have been microfilmed — though there are a handful available through interlibrary loan from the Library of Virginia in Richmond. You’re going to want to go through the court minutes and dockets, the tax records and so much more, since the sheriff was involved in so much. And in the interim, while you’re planning that trip, never ever forget about the fabulous, free, word-searchable collection of early newspapers online at the Library of Congress titled Chronicling America. I don’t want to give too much away here — but you’re in for such a treat if you head to that collection, choose Virginia as the state, the years from 1870 to 1915 as the dates, and enter just the name Rorabaugh as the search term. Definitely a Prince here in terms of records, Allissa. Have fun tracking him through them all! What a fund of information! A treasure trove in RELIC. Local collections still hold these incredible treasures. Right now I’m preparing several of my ancestors’ records to be archived in a local collection in South Carolina. Probably the South Carolina Historical Society in Charleston. Of course! Never new that “shire” and “reeve” together made up “sheriff,” but should have known from reading Chaucer and my general English lit background. Very nice. Hubs will like this bit of info! Thank you. Mariann, local collections are often literally the best thing since sliced bread for the genealogist, and you’re to be commended for thinking of how to preserve your own ancestors’ records by making sure they get to a local repository! Thank you!! Very cool. Now I’ll have to go find out what I can about sheriffs in Tennessee. My great-grandfather, John Calvin Parker, was sheriff of Benton County, TN from 1914-1918. My dad told a story, though he doesn’t remember the details exactly, but g-grandfather Parker had a black man in jail, and he was broken out of jail and hung. This was upsetting for my g-grandfather, and it is said that he didn’t run for sheriff after that. He didn’t give up service to his community though, as he became the county clerk for many years. Oh, that sounds like such an interesting story, Melissa! Please let us know what you find! My ancestor Francis Marbury [ca 1730-1795/1800] was a constable in Precinct E of Loudoun Co. VA in 1761. There is much about him in the records but he is eclipsed by his younger brother, Colonel Leonard Marbury, who led a very colorful life. “Colorful” is a good word for Col. Marbury, for sure! Very deep research into the Colonel, including 1783 privateer papers from Gov Lyman Hall, the ancestry of wife, Ann Somerville (proving Burkes Landed Gentry incorrect), his Augusta properties, his development “Springfield” in Augusta, letters to George Washington, etc. he was “colorful”. Francis Marbury of Md., Va.and Rowan Co NC was my ancestor too. My great grandmother came from Stanly Co NC, a descendant of his. I now live in DeCatur, GA and have quite a bit on the Marbury line. That’s great, Ken! Hope this was as interesting to you as it was to me.